Patrick tries the long-arm scraper with steel blade. 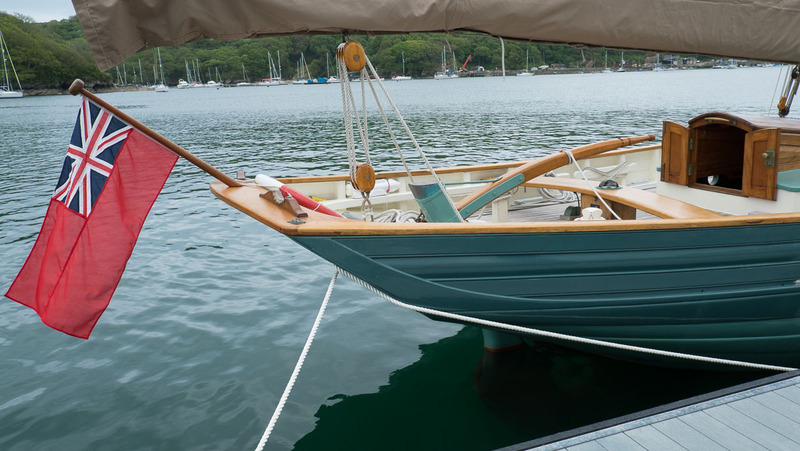 If you own a boat for long enough you may be faced with one of the most daunting challenges a DIY boat owner can have… stripping old, cracked and peeling antifouling back to a bare hull. My time was up this spring. I knew it was coming and after Karen and I purchased a C&C 30 last fall we realised this job was looming on the horizon. During the pre-purchase haul-out and survey it was clear that the task was imminent. She’s a fine, strong boat and the price was right so we decided to bite the bullet and get on with it. Big factors will be time and money. You will probably have one or the other and if you have both then count yourself as being very, very lucky but even then care is needed. Avoiding charlatans, gimmicks and rash promises can be tricky. 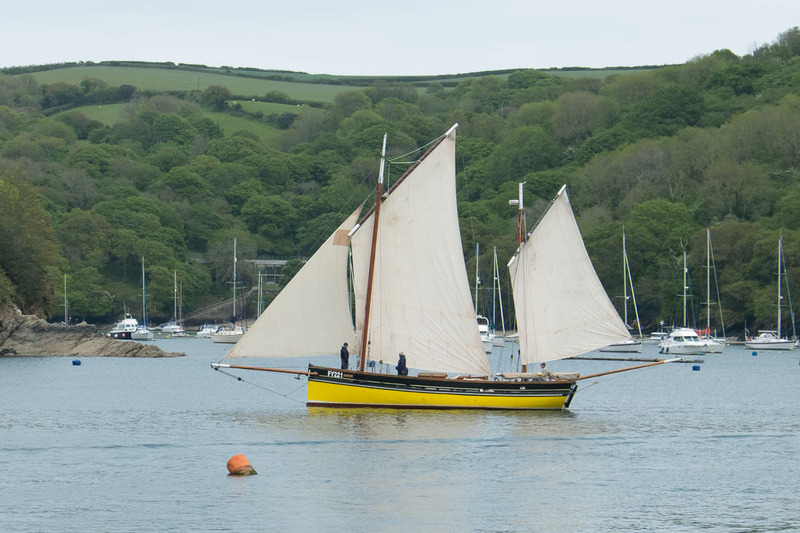 And even with all the money in the world you may be unable to nail down a reliable shipwright or out-of-work yacht bum to do the grunt work – especially in the spring when they are in peak demand. 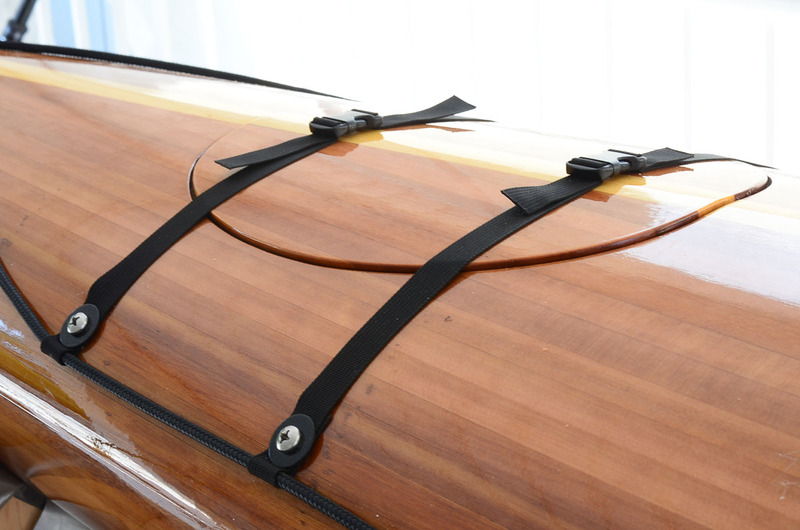 If you are flush with cash then this is probably not for you anyway as you probably have a spanking new boat that won’t need serious bottom work for many years to come. Skye Five spent the winter in Captain’s Cove Marina in Ladner, BC. The Marina allows owners to freely work on their own boats. Skye Five was hauled on the 15th March and I decided to rent the yard’s pressure washer to clean the weed off. Lucky I did, as I discovered that if I held the nozzle close enough, not only did the weed and barnacles come off but large slabs of old antifouling too. With the yard’s approval, I continued for 3 hours with only a five-minute break to put more gas in the machine. My shoulders and arms were killing me after grappling with the writhing hose but at the end of it I figured I had removed 60 – 70% of the horrid stuff without getting much on myself. I had clogged the drains but I felt victorious. The yard manager was pretty amazed too. Pressure washing removed a lot of loose antifouling. The euphoria was short lived, however, as I began to tackle the remaining 30 – 40% the following day. I had help. Karen’s son Patrick used a day off work. Little did he know what he might be getting in to. Between the two of us we spent an exhausting 16 hours attacking the bottom, armed to the teeth with various scrapers. These fell into two camps. The very long handled variety with steel blades – very effective but the blades required sharpening every 10 minutes. The other, somewhat shorter scraper came with a reversible tungsten carbide blade. I used two carbide blades for the whole project, eventually abandoning the steel scrapers. Twenty-five hours of back breaking, shoulder burning work was needed to get the hull ready for final sanding. I’m nudging 60 and starting to feel it. Young studs may not be so challenged. It’s filthy, hot work. You need all the protective gear – goggles, dust masks, safety glasses, hazmat suit (well, painter’s coveralls). It then took 10 hours of sanding to prepare for paint. Eighty grit worked the best. The dust was extraordinarily obnoxious and had a tendency to find its way into everything. You have to “decontaminate” at the end of each session to avoid the worst. Once kitted up I would work non-stop for 3-4 hours because I just didn’t want to go through the rigmarole of getting the gear on and off. Fortunately, the weather was unbelievably benevolent for Vancouver and I had five days of sunshine and temperatures in the low teens – perfect! So, after 37 hours of probably the most grueling work I have ever done, I stepped back to admire a job well done. Was it worth it? Are there better or cheaper alternatives? Well I did look into using paint stripper. There are some soy based products out there but none I could find in Vancouver. I could have brought some in from the USA but I had left it too late. As for materials, the cost of 40 sanding discs and 3 scrapers hardly touched $100. Paint stripper would have been way more expensive and I still would have needed to sand the hull. The yard also warned not to use soy based stripper if the temperature was below 20C. They had seen expensive failures last year using a soy based system – the weather was too cold and a second application, applied by a contractor at extra cost was needed. I was told that if conditions are right it works well. Web searches showed some pretty mixed reviews on all types of paint stripper. There are blasting options but these are not generally DIY and therefore expensive. I could have just sanded, preferably vacuum sanding, but I’m not sure that would have been any faster. You also need to apply a lot of pressure for rapid removal and believe me, that is not easy when working above your head, sometimes crouched, sometimes kneeling and sometimes sitting. Given the pain it was definitely a case of “mind over matter.” At the end of it I gave myself a pat on my very sore back as I had endured way more discomfort than I ever knew was possible. The other really, really big consideration is the impact of the dust created using scraping and sanding. The yard, quite rightly, insisted that I tarp the hull off to contain the dust. 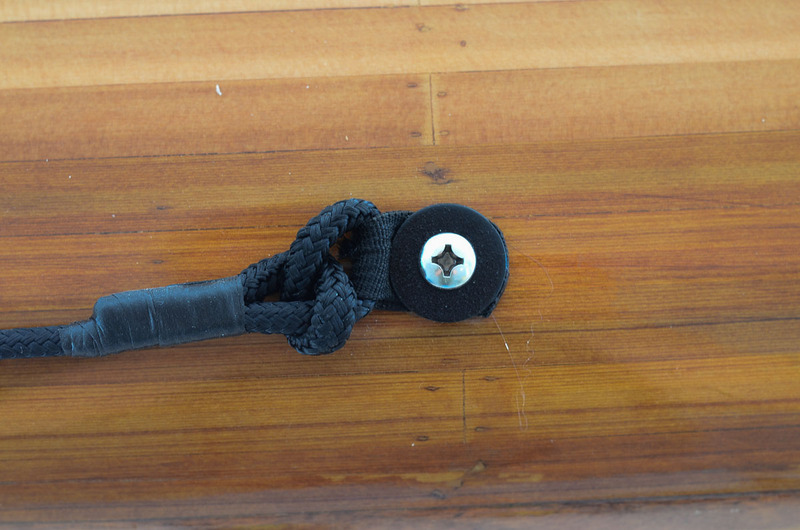 A roll of construction plastic and some Tuc tape worked very well and I did manage to remove the tape without leaving a lot of goo on the boat. There was very little wind which helped keep the dust in one place. The last thing the yard wanted was a fine red film on freshly detailed boats. I think I met their requirements – at least there were no complaints. Almost done! The tent contains the nasty red stuff. Well, it took 37 hours of scraping and sanding. If I hadn’t struck it lucky with the pressure washer it would have taken considerably longer. It’s probably the cheapest way to do the job by far – if you are providing your own labour. Also be realistic about the length of time it’s going to require. Yard space is not cheap. Keep in mind that if you start out scraping you can switch to another method if it doesn’t work for you. It’s just starting to rain so the new antifouling will have to wait. Right now I’m heading off for a well-earned beer. 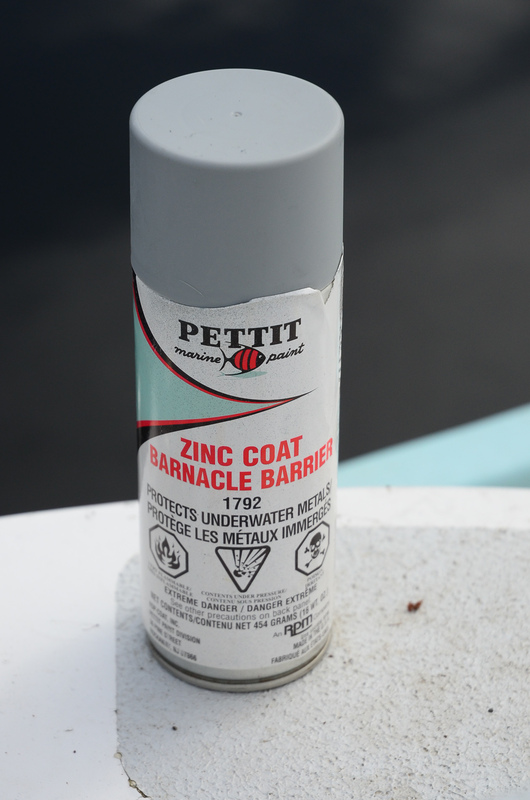 Applied as a spray, Pettit claims Zinc Coat Barnacle Barrier will protect propellers from barnacle build-up. I still haven’t figured out why the bronze propeller on my boat is the first thing to become encrusted with barnacles after a haul-out. 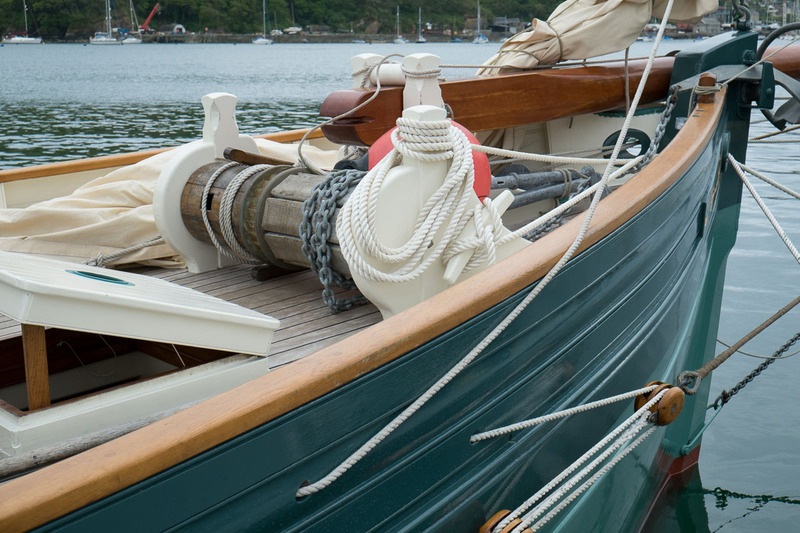 After all, the main constituent of bronze is copper, and my Pettit Horizons antifouling is loaded with copper and it does its job very well elsewhere. But propellers are generally left bare, probably because modern ablative coatings wouldn’t last long due to the high velocity flow across the spinning blades. Strictly speaking, my prop is probably a manganese bronze which really makes it a brass. Are you confused yet? Well, a brass is an alloy primarily between copper and zinc, typically with 60% copper. True bronzes are usually an alloy of copper with silicon or (now less common) tin. Brass is an inexpensive alloy and very easy to cast into intricate shapes. Unfortunately in a marine environment brass is very susceptible to corrosion and that’s one reason why a small amount of manganese is added. The zinc and copper are not a homogenous mix. Zinc rich areas are electropositive relative to the copper rich areas and consequently zinc dissolves from the surface by electrolysis in the zinc rich areas. 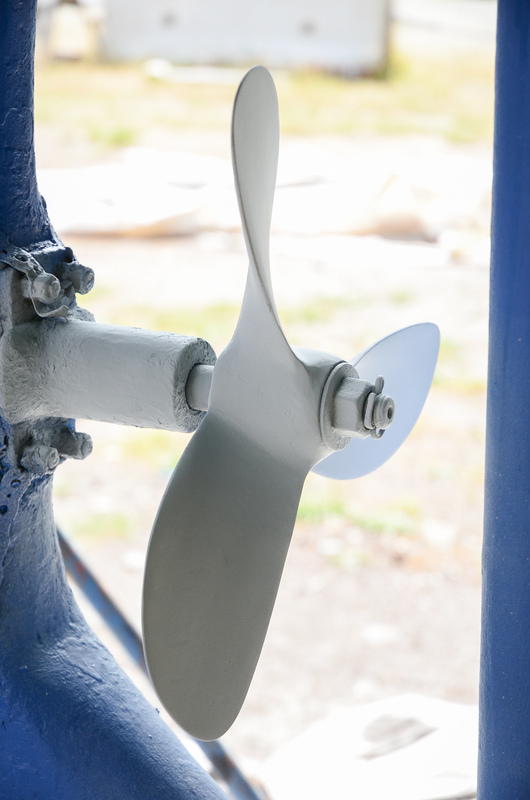 If your freshly polished propeller has a blotchy pink appearance than it is likely to have already suffered some “dezincification.” Some of the zinc has gone leaving a weak, spongy copper rich areas. This can eventually lead to structural failure. That’s why propellers should have some form of galvanic protection, typically in the form of a zinc anode attached to the shaft. Rainbird’s propeller shows signs of dezincification. In spite of these areas being copper rich, they are still prone to marine fouling, which is perplexing. 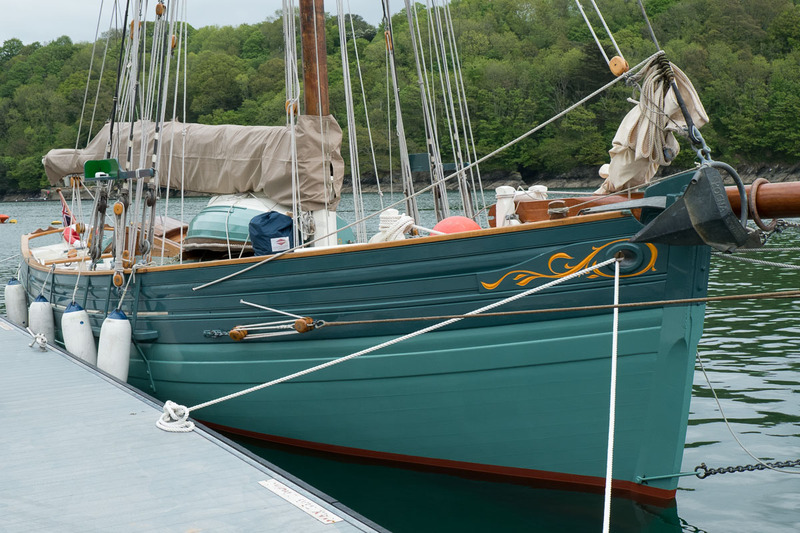 Perhaps copper in antifouling is just more readily available to prevent fouling. I normally polish the propeller with a fine abrasive and leave it untreated. At a recent haul-out, the boat yard suggested that I try Pettit’s Zinc Coat Barnacle Barrier to prevent barnacles growing on my propeller. This comes in a spray bomb and the instructions recommend 3 coats applied one hour apart. This is easy enough. So why would zinc work as an antifouling? The zinc in my prop obviously doesn’t do the job so why should I expect this to work? Once again, maybe it’s availability, and as the yard pointed out, when was the last time I had seen fouling on a zinc anode? Time will tell if this is an effective solution and I’ll keep you posted. 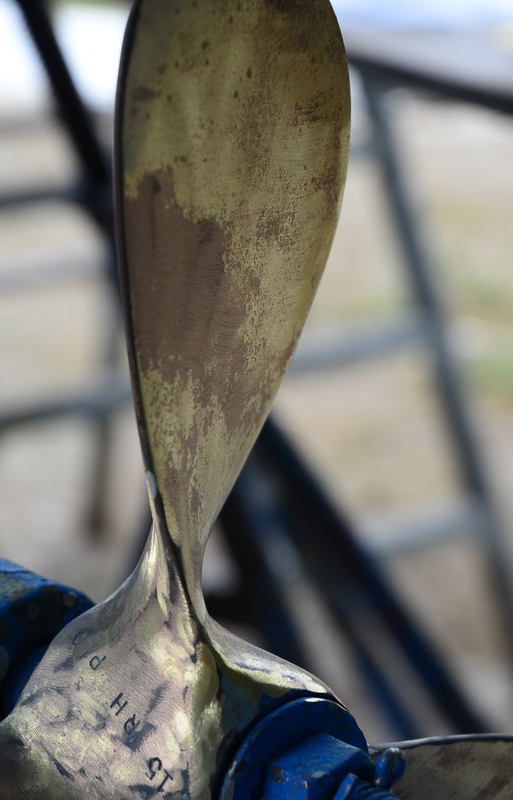 Ready for launch; Rainbird’s propeller after three coats of Zinc Coat Barnacle Barrier.